imported twinkle lights.” Clark Griswald had only the best of intentions for an “old fashioned family Christmas.” We have all been there and know these visions are hard to shake. Imagine magical twinkling lights draped over the fresh, sticky Christmas tree cradling priceless family ornaments; a warm kitchen and the smell of Christmas dinner; meaningful conversation with family occasionally interrupted by happy children running and playing with their new gifts. It is this vision that drives us out into the cold garage for tangled, broken lights. It is our motivation to create wonderful memories for our family that leads to two full days literally slaving over a hot stove only to suffer from dishpan hands and unending piles of dirty dishes. What if I told you that you could have that fun, old fashioned family Christmas without all of the pain and sacrifice? Just find a picture perfect town already decorated for Christmas. 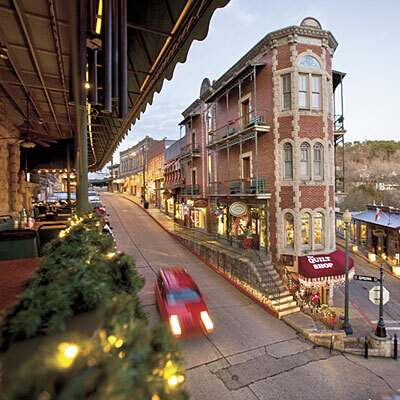 Hidden Elves and Living Windows make Christmas shopping in Eureka Springs Extraordinary. 23rd Annual Antique Show. November 18-20. Preview the show with wine and cheese on Friday, November 18th. Winterfest. November 25-26th. Fine art show and sale. Downtown Hidden Elves. November 25th. 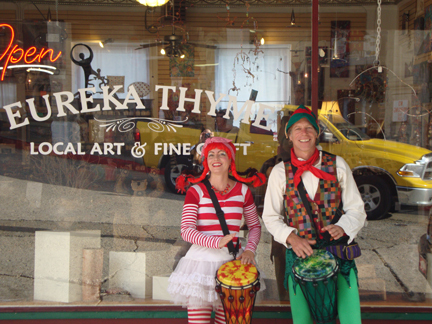 Explore historic downtown Eureka Springs and find hidden elves and Christmas costumed fold for gifts at every location. Living Windows. December 2nd. The shop windows in historic downtown Eureka Springs come alive. Santa in the Park. November 25th. Photos with Santa. 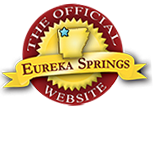 November 26th, December 3rd, 10th Brought to you by EurekaSprings.com. A professional photographer captures you child’s visit to Santa’s lap. Lighted Christmas Parade. December 2nd. 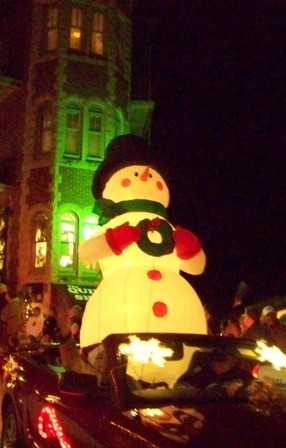 Festive floats, walkers, bands and thousands of lights make their way through downtown Eureka Springs. The Running of the Santas Fun Run. December 3rd. Dress up as Santa and run through downtown Eureka Springs with people of all ages and fitness levels. Lots of prizes, fun, and Santas. 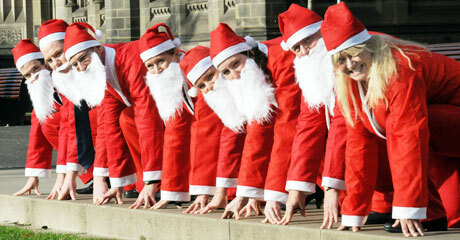 Register to run with the Santas. Tour of Homes with the Eureka Springs Preservation Society. December 3rd. See the interiors of Eureka Springs most beautiful (and often privately owned) Victorian homes. Christmas Tree Lighting Ceremony. December 3rd. Part of Christmas at the Crescent. 30 Christmas trees are decorated and lit in the Crescent Hotel Garden. Free Christmas Movies in Dr. Bakers. December 4th – 9th. Part of Christmas at the Crescent. Free holiday movies. Holiday Musical Performance. December 5th, 6th & 8th -9th. Part of Christmas at the Crescent. Enjoy the sounds of Christmas in the beautiful Crystal Dining Room of the Crescent Hotel. Sweet Treats Tour. December 10th. Tour Eureka Bed and Breakfasts and enjoy sweet treats (and recipes) along the way. Candles and Carols Christmas. December 10th. Explore the Queen Anne Mansion in the evening hours when fireplaces fill the magnificent mansion with a warm glow, accenting delicate ornaments and priceless treasures while Mrs. Claus reads Christmas Stories to children 12 & under in the family parlor. A Season of Celebration. November and December. Enjoy a musical holiday show in the Pine Mountain Theater. A Queen Anne Christmas. November and December. Let the sights and sounds of Christmas warm your heart as you marvel at Victorian Christmas decorations throughout the Queen Anne Mansion while Christmas carols play softly in the background. Tour includes a unique exhibit of “Santa through the Decades” Collection. Calm Before Christmas Village Display. November and December. See a 350 piece Victorian Snow Village,lighted and surrounded by several antique train sets running through the display. This is your chance to view what Eureka Springs must have looked like in the 1800’s. Great family fun with every detail beautifully done. Shameless Sequin Soiree. November 25th. Dress up for a Fine Art Event held in The Queen Anne Mansion. Silver Tea. December 1st. You won’t want to miss this long standing Eureka Springs Christmas tradition. Santa’s Brunch. December 4th. Part of Christmas at the Crescent. Dicken’s Christmas. December 6th. Enjoy a holiday feast with Charles Dickens in the beautiful Crystal Dining Room in the Crescent Hotel. Part of Christmas at the Crescent. Christmas Ball. December 9th. Spend the evening dancing. Enjoy complimentary wine and hors d’ oveuvres’. Find more information on these and other events on the Official Calendar of Events for the Greater Eureka Springs Region and in the words of Clark Griswald, “Press on and have the hap hap happiest Christmas….Drumroll please.” If you don’t know, quotes were taken from National Lampoon’s Christmas Vacation. It’s our family’s favorite Christmas movie. This entry was posted on November 16, 2011 by estcblog in Arts & Culture, Crescent Hotel, Culinary Adventures, Festivals, Fun Downtown, Musical Adventures, Shopping, Things to Do and tagged antiques, art galleries, christmas, Christmas Ball, Christmas Festival, Christmas Vacation, culinary, downtown, Eureka Springs, food, free stuff, historic downtown, history, house tour, movies, parade, winter fun.